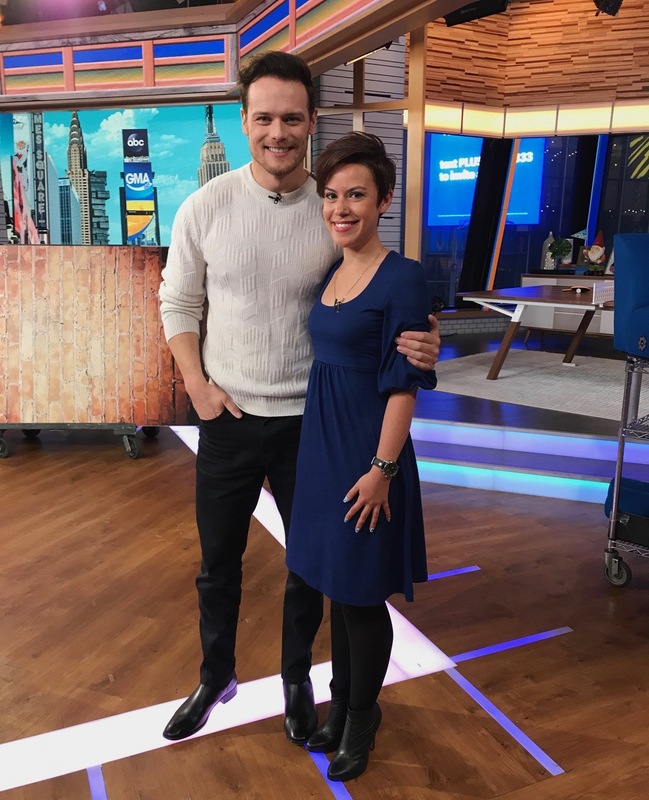 Home / Outlander Events / Season 4 / LIFE MADE: Just another Monday meeting Sam Heughan on GMA! Here’s the skinny on how the greatest day of my life happened! It all started on a Thursday. I was given a heads up the night before by one of the admins of the New York Outlander 5 Boroughs Facebook group that GMA (Good Morning America incase you’re not clear) might be contacting a few fans about an opportunity to meet Sam Heughan. This particular admin is a superfan of Richard Rankin so she demurred about the opportunity and instead gave the producers a few emails and one of them was mine! For some who might know me pretty well or follow me online, I make it known that I am a bit Tobiased but if given the opportunity to meet Sam or Caitriona, frankly anyone involved with Outlander, I am so game. 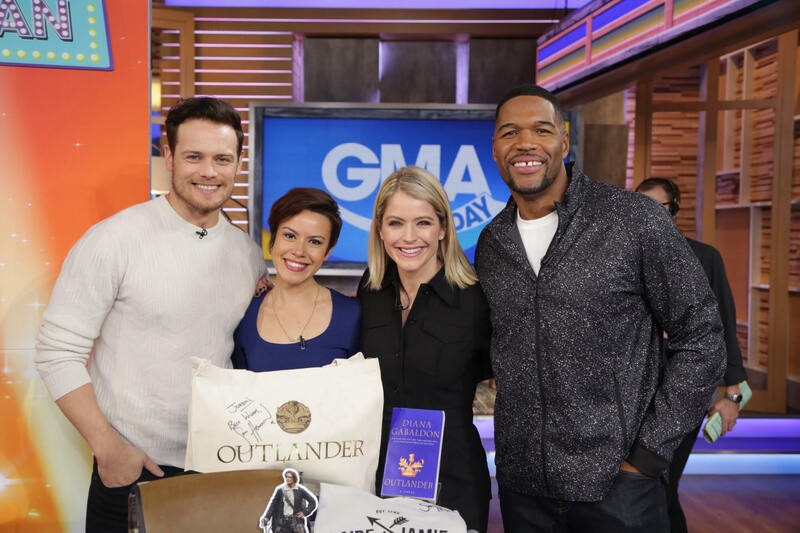 A GMA Producer reached out to me on Thursday wondering if I’d be available on Monday to meet Sam for a “Superfan vs Superstar” game (uhhhh YES) and in the meantime could I answer a few questions about me and what made me a Sam/Outlander Superfan? I sent embarrassing pictures of myself and links to all my social media accounts. We chatted on the phone and she asked me a few trivia questions that I totally blanked out on like Sam’s birthday! Well I didn’t blank on that because I didn’t know it. To be fair, I don’t know Tobias’ birthday off the top of my head either. As my friend put it: These are not the important questions! I got off the phone with the Producer understanding that she would call later that day after she reviewed more of my personality and talked to a few other fans. 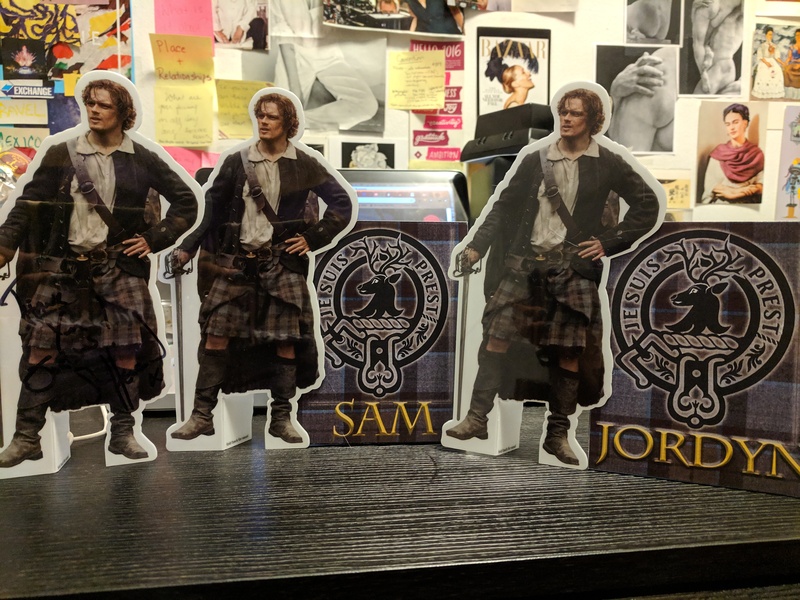 I had an idea of who I was up against and one of them was someone who had a cardboard cut-out of Sam in her home which I do not own and I knew my Tobias Menzies pillow wasn’t gonna cut it. In other words, I wasn’t entirely sure I was gonna get it. Late Friday morning rolled around and no word but by the afternoon I got a call “just confirming everything for Monday” and I was like ahhhhhhhhh! In my nervousness and disbelief I asked if the segment was me competing with other fans? “It’s just you and Sam,” she said matter-of-factly and I squeaked an “Okay….”. She wouldn’t tell me what the prize was but I said that as far as I was concerned I was already a winner. I mean what could top this experience already right?! Well that weekend I was grateful that I already made a previous hair appointment but I also got my nails done (which I NEVER do). My friends and family were totally freaking out along with me. I didn’t get much sleep that weekend. Monday morning finally arrived and I got myself ready with my outfit, put on my Sassenach necklace, and of course did my hair and makeup. 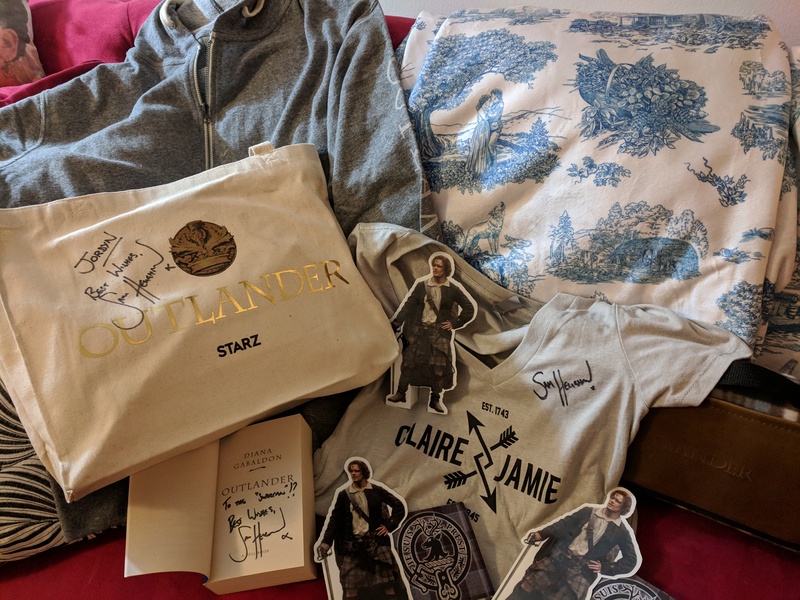 The Producer mentioned I could wear a Sam t-shirt if I had one (I don’t) but my Outlander t-shirts were NOT flattering on national television; I was gonna wear something way better. I got to the studio about thirty minutes early and I didn’t want to be annoying so I nervously hung out at the Millennium Hotel across the street for about 5 minutes until the Producer texted me confirming that I was still coming for the 8:30am call time. I quickly texted back that I was two minutes away (more like thirty seconds)! 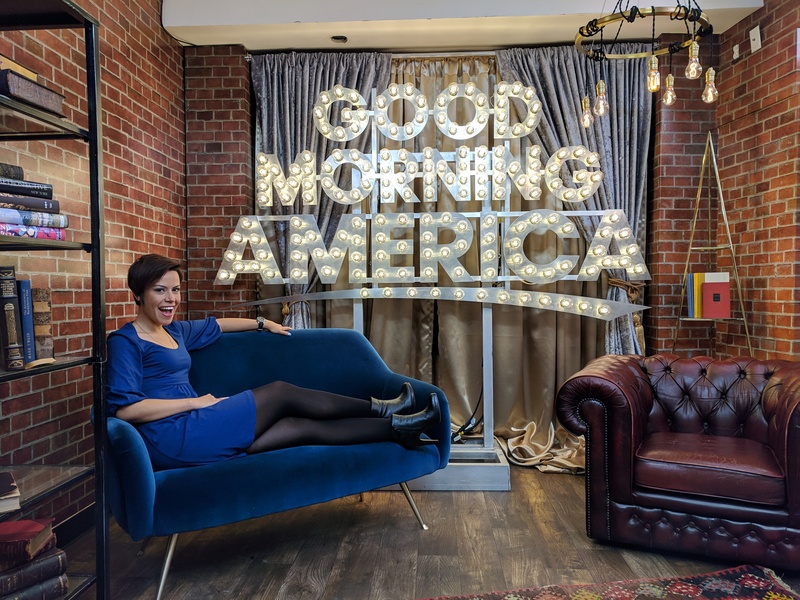 Backstage at GMA is like a labyrinth with numerous rooms, people walking in and out and down the hallways, host Robin Roberts taking pictures with that day’s guests, and little old me sharing a green room with a herd of high school kids that were on the show. Clearly my request for a private green room with champagne and Sam feeding me grapes was not met. One of the funniest moments included me getting lost from the HMU room (hair and makeup) to the green room and rounding a corner to see Claire Foy walking towards me. I panicked and quickly went in the opposite direction because I was not ready to suddenly see The Queen. Enroute I found Sam’s green room (he hadn’t arrived yet)! Speaking of which both the HMU ladies asked what I was doing on the show and I exclaimed “I’m meeting Sam Heughan!” to which they responded, “Who?” Additionally, the Producer had asked for some fun facts about myself and I said I went to Scotland last year to which she asked, “Why?” Clearly I was not with my people. For anyone wondering, no I didn’t meet Sam before the taping. Why allow me to get my nerves out before everyone sees it on TV, right? Also, full disclosure, I was prepped on some of those questions seeing as they really wanted me to win. Think about it: Superfan meets Superstar crush on national TV so she HAS to win. Although honestly, I knew most of the answers. Bianca the Producer was so nice and she took a few photos of me backstage and I’m eternally grateful! They came out great! After waiting for about 40 minutes in the green room getting smothered by excited high school kids for their own segment, I got mic’d and they had me waiting behind a screen on set “to watch some of the filming” but really that was code for “we don’t want you to see Sam when he walks past your green room heading to the stage”. I know how these things work! Finally, I waited off wing as the crew quickly got the stage prepped for the game. I’m used to how these things go because I work in film and TV production although day time talk show formats are not my area of expertise. I work in long-form scripted film and TV so seeing the innumerable number of people working behind the scenes was not a surprise but it was fun seeing it all in real time! 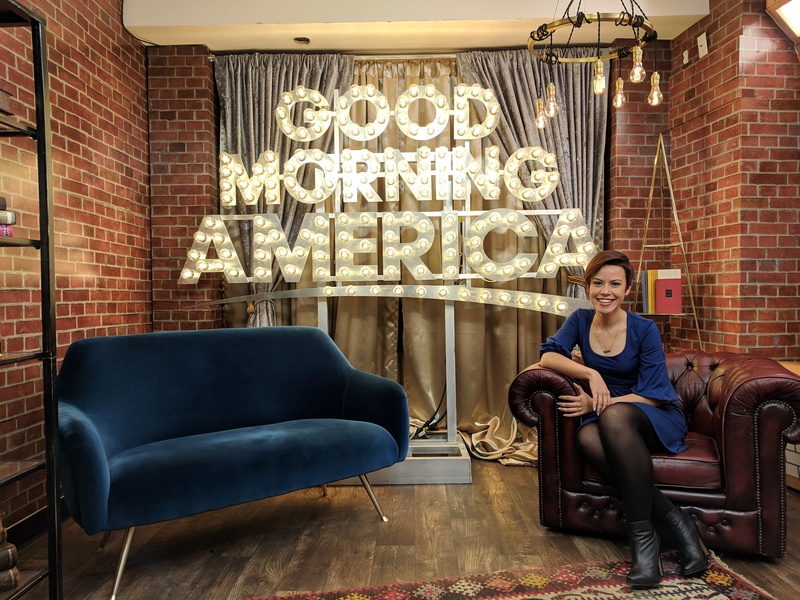 While Sam did his interview with Michael Strahan and Sara Haines (she is very nice and cool btw) I stood by my little podium clapping and smiling like a dope. I knew it was gonna go by so fast (my dear aunt and the GMA Producer warned me) and it was SO true! When Sam and the hosts started walking over I think the butterflies flew into overtime. For whatever reason I was surprised that Sam shook my hand and gave me a hug right there. I’m not sure if he was unsure what to expect from me (“How crazy is this fan?”) but it was SO nice that he did that. I think plenty of actors would have kept their distance and just did a friendly wave from afar right? I dunno! I never met him before! During the game, I had to read his vibe a little and see how competitive he’d be to ensure my quick hand on the buzzer. He was really going for it! He didn’t really cut me a break! I wish the hosts had asked me about my love for Outlander because I had prepped a response when told they might. Why not ask me questions about why I’m a Superfan because I have so many reasons! So briefly I will divulge here what I would have said on the show: While watching the show religiously and reading the books, I started a blog a few years ago and now embarrass myself on YouTube and Instagram. I tweet all the time. I went to Scotland last year and I chased Sam down 5th Avenue when he was Grand Marshall in the Tartan Parade. Perhaps because of time they didn’t get to ask me but that’s ok! After the game and taping, we took some pictures. My one regret: Not having the courage to make small talk with Sam Heughan. I totally panicked! Michael Strahan was making trivial chit chat with him while I awkwardly stood to the side. Even when I took a solo pic with him I couldn’t muster anything beyond a thank you and I WILL FOREVER REGRET THIS! I even had two topics of discussion such as how much I loved traveling to Scotland and that I’m really looking forward to the whisky he’s working on. It was all so fast! I suppose this means I know better for next time I meet him (if I’m so lucky again). It all makes me wonder that if I’m like this meeting Sam then meeting Tobias would be….<no words>. The prize was pretty cool and Sam signed a bunch of it. My favorite? Sam signing the first Outlander book, “To the Superfan? !” The Producer was nice enough to fetch the two name signs that were on the podiums so I have even MORE Pocket Jamies (a total of four now). Afterward, I went back to the green room in a daze, took my boots off and put my flats on (I rarely wear those boots they’re so high! ), said my thank yous to the crew and Producer, and headed out. While Sam was comfortably sitting in the back of a (dry) SUV onto his next promo event, I was walking in the pouring rain with my feet soaked and my loot getting on the F train which was moving so slow back to my apartment. So glamorous right?! Everyone was calling me and so excited to see it air. My Twitter and Instagram followers increased which is cool! Fans were really excited for me and I love that. Don’t get me wrong, if it was someone else I would’ve been jealous too. Sometimes life gives you an unexpected curveball but this one didn’t hit me in the face and leave me with a nose bleed and bruises. Whew! The fun doesn’t end here! I’ve been Tweeting, Insta-ing, YouTubing, and FBing for a while so let’s connect!